Getting your children to do their chores the postmodern way! Do you set a timetable/schedule for your children to do their chores and homework? How’s that working out? When I speak to other parents about this, the hotspot is normally – problems with ensuring that the timetable is followed. I think we all know that shouting doesn’t work, especially with teenagers. Mine have mastered the art of (their words) “blanking me”. I could simply use the traditional management “carrot and stick” approach – by punishing non-conformance (before anyone reports me… not literally with sticks… grounded… no TV… no allowance, etc) or rewarding conformance with incentives. 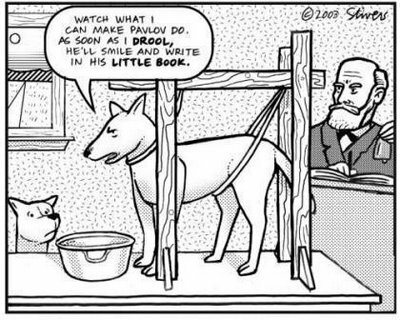 Kind‘a like giving the dog a treat for performing a trick. I know bringing up children can be a bit of a circus sometimes but I don’t really want to think of my kids as performing ponies! Anyway, they’re on to us – see attached of pic of Parlov’s dog. It occurred to me that the long-term solution might be to try and create a family culture where our espoused values are lived out even in the family context – not just when Children in Need is on. Which family doesn’t like to think of themselves as thoughtful, socially responsible and caring? Wouldn’t it be awesome if there was a secret to make these values “live” in the home setting too? The Modernist approach: Rules based – regulate through punishment and incentives. The late-modern approach: Win their hearts and mind through (pop) psychology. Postmodern: Co-create a shared reality through conversations and inquiry! This principle can be applied to whether we succeed or fail in co-creating the practical realities we want in our home life. Post-modern or just common sense? Our relationships fail or succeed, gradually then suddenly, one conversation at a time. In the end, the secret’s no secret at all. We create the family reality we want – one conversation at a time. Talk to each other. Listen – really listen by this I mean listen to understand, not to argue. Ask questions. Be curious. However, we need to be mindful that every conversation is part of the journey (to success or failure). And any one of these conversations could be the tipping point. That’s why it is important to treat each and every conversation as the one that might be the ‘suddenly’ conversation! Next Post Jesus and social constructionism!